of which are supported by the San Fernando valley Bar Association’s Valley Community Legal Foundation (VCLF) and the generous donations of committed, community Valley residents. In high school, she realized that success at her studies would be the key to becoming a strong, independent woman. Her resolve paid dividends, and after completing her undergraduate degree in political science, she earned a master’s degree in public administration. The subsequent years she spent working for an immigration attorney awakened the aspiration of becoming an attorney herself. Working with people of different backgrounds taught her that a career in the law would be more than just a job– it would give her the tools to help bring struggling families together and help reunite estranged family members with their loved ones. Having grown up in Latin America, Myrna knows all too well the trials of poverty, the hardships of financial instability, and having to face the gut- wrenching choice between clothing, food, and education. Myrna is now in her second year of law school. Looking back, she thanks God for giving her the knowledge to lead her life in the most positive way possible. Looking forward, she is thankful for the Valley Community Legal Foundation for their encouragement and support. 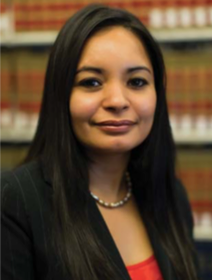 “Law school has made me a different woman—a woman with bigger dreams and hopes,” said Myrna. Law school is by far one of the most difficult things that I have experienced. “It has taught me about stress, anxiety, and doubt. But I know that everything that I am going through is worth it because becoming an attorney is my greatest dream,” she said. Every year the VCLF is proud to offer financial scholarships to qualified and worthy students from the San Fernando Valley who are pursuing a legal education. We are all encouraged by the amazing people that we support like Myrna Velasquez. On behalf of the VCLF, I truly thank you for your continued support, and I wish you a healthy and joyous holiday season a most prosperous New Year!